Estimates: Over 100 people saw exciting hang glider flights today. Over 10 persons were directly answered about WS instruction. Best guess is that our over 100 flights today will bring significent business to WS. I carefully counted my flights at 52 in honor of Angela's recent birthday and graduation. And my best guess is that Bob Kuczewski slightly overmatched my count, so about 54 flights. Sunset closed our flying. My tissue report: from sand in right shoe: bruised right toe next to big toe; estimate of 4 days for healing; [ ] get shoes that do not let sand inside the shoe. Left hamstring was strained some; estimated healing: about 4 days. Harness rub of chest; cushion needed. Bruise lines on inner thigh from leg straps; the 54 launchs, glides, and wing returns all work the straps agains the skin and muscles; [ ] padding is needed. Great cool air with interesting sky; wind direction was good all day. Wind speed was pleasant-to-good all day. Meal together after flying was satisfying. Thanks, Bob, for making the trip to Dockweiler in your repaired van. We flew the Alpha 210. Susan did a superb job at cleaning a south launch and LZ; she's been training at Dockweiler and Sylmar. The last 10 flights or so by JoeF were done with a harness hang point closer to his body CG; effect was most pleasant. The photo BobK showed was with Joe's hang point far away from his CG. Dockweiler seems to get wind about 5 mph less than what is reported at LAX weather station for May 8, 2018. 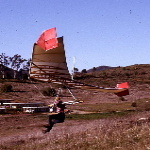 Frank Colver noted: "BTW – Be prepared to see my new inflatable sand wheels on my Condor at Dockweiler. These will be great shock absorption on hard landings @ about 2 lbs pressure." Jim F. and Joe F. snoozed while Frank went ahead! Congrats, Frank! 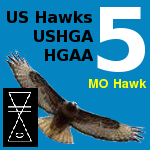 Bob flew; then he returned the wing; he was cause of putting potential energy into the wing. Then Joe used the potential energy installed by Bob in order to glide. then Bob used Joe's graced potential energy for a glide. Such community cooperative grace cycles continued during about 7 hours. On drive home: right leg hamstring knotted; such severely bothered using accelerator and brake on my truck. I pulled over to side of road and parked; then walked out the knots. Toe blister mentioned: good-sized blister. Will aim to streamline Alpha 210 cross tubes and tubes of the triangle control frame. Will aim to streamline body in prone position. Sorry to hear about your injuries, Joe. But it sounds like a lot of flying was done! I also can't wait for the Colver Sand Wheels! Pictures should be posted once they arrive at the scene. And in talking about streamlining the exposed tubing on the Alfa, I created a very neat system to do the same thing on my WW Raven back in 1980. I bought some Lexan sheeting and made a c> shape out of it. The tube (obviously) went into the front (round) section. Inside the tapered end I put (one inch wide) closed cell foam "wedges" every foot or so. They were held in place by Velcro - on the top and bottom of the foam, and the inside top and bottom sheet of Lexan. The Velcro makes it easy to install and remove the streamlining covers and store them until the next time the glider is set-up. Also, the Lexan meets (and separates) at the trailing edge of the stream liner. Velcro also holds it together all along the TE. As I recall, each section of Lexan was 2' x 4'. So, let's say one side x-tube was 8' long, then two 4' sections of Lexan would cover one side. You'll have to see about the width needed to wrap around and create the "airfoil" shape. But the best formula is to create a 3:1 taper (but, including the tube dimensions the taper would be 4 units long to 1 unit high). If you want to get even fancier you can use 2-3 layers of pin striping tape to add "trubulators" to the front of your stream liners. As I recall they are placed 30 degrees above and below the front to back mid-line of the stream liners. BTW - The info above involved a fellow pilot who was in college taking a course in aerodynamics. He gave me the (essentially, 4:1) taper figure as well as the position for the turbulator strips. He also used a sample I created for him and tested it as part of his class. Of all the samples (about 4) he tested, mine (with some obvious help from him) reduced drag the best. He also explained that making the taper less or more actually creates more drag (i.e., a 6:1 taper is not better). Joe, I keep a bottle of the quinine pills for stopping leg cramps in my glove compartment for such times. They are for people who get night cramps and are available at most drug stores. You put them under your tongue for quick relief. For real time Dockweiler wind I use the Scattergood Power Plant weather station instead of LAX: http://www.weatherlink.com/user/scattergood. It's located on the corner of a building above Grand Ave up the hill. SCOTT, CHECK YOUR MAIL BOX. Bill, Check your mail box! Read down a bit and you'll find that relaxing, stretching and drinking pickle juice (!) work the best at stopping muscle cramps. My only question is, would that be sweet pickle juice or dill pickle juice? I don't know if Joe used your muscle cramp remedy, but we had another great day at Dockweiler. It was soarable in a Wills Wing Alpha 210. Joe and I flew well over a dozen flights each ... and most were soaring flights!! 1. Supervisors of the County of Los Angeles were treated to an excellent one minute presentation by Bob Kuczewski that amounted to a big super gratitude expression thanking the supervisors and members of the Beaches and Harbor for their winning effective good actions that have been establishing recreational hang gliding for the public at Dockweiler. JoeF also spoke but his one minute stream of dream thanks and illustration of a recreational benefit from hang gliding at Dockweiler may need to be put in writing to be understood; at least the pithy minute was positive in tone without asking anything new from the supervisors. 2. We had a soaringly good time. Bob had one flight where three figure-eight bluff passes were completed. In another down and back flight he milked the lower part of the bluff to sneak his way back along the bluff. Nice flying! 3. After meal we drove to return the Alpha 210 to JoeF's place where Bob improved JoeF's incomplete analysis of a vacuum line in JoeF's wing-carrying truck; thanks, Bob! Next morning JoeF awoke and went to the truck, risked pull off the terminal of the vacuum tube that was leaking air at the junction with the intake manifold. The terminal was extremely cracked and no good for using. JoeF walked toward a junk-car yard (a suggestion by Bob the night before) by way of the railroad tracks. JoeF has a habit of picking up things along his ways; well, he picked up many car parts; one part was an electrical item that had a terminal of rubber on it; he broke the terminal off and the item had correct sizing of interior diameters that turn out to fit the vacuum hose and its join to the manifold. Presto: super-savings; no mechanic, no store, no purchase, but reuse of a discarded part. The fix felt like a soaring flight using gravity and wind and effort. Wing-carrying pickup truck is back in service for carrying wing to Dockweiler! Open free rec. HG is disallowed on this day ---May 23rd, Otto Lilienthal's Birthday, if u$hPa-based insurance-oppressed business opens and uses its usual or so 10% of the public site for profit leaving 90% of the public land asset unusued; such for fear that someome might mistake a rec. HG person and wing for the concessionaire wings and sue the wrong party. Tyranny of fear lives, not Otto Lilienthal this year's BD at Dockweiler. Work is yet to be done. The food concessionaire there does not prevent people bringing a sandwich to the beach to eat (fly) for fear that a suit will be against the food concessionaire if someone brought a poisoned sandwich in their picnic basket. 2018 ! 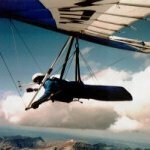 California and County of Los Angeles and City of Los Angeles have a way to go to be recreationally wise for recreational hang gliding. Boycott the concession? Reason with the County? Two-site solution? Obliterate the repressive intrusion of a monopolistic insurance RRRG? Close the concession? County demanding that RHG be not boosted aside by fact that a concession operates (concessions elsewhere in the system do not preclude parallel eating, skating ,cycling, swimming, surfing, kiteboarding, sailing, running, walking, skipping, kite flying, balloon holding, umbrella using). My core aches about the situation permitted to exist by the County; the mandate for public recreation is deeply unfulfilled yet. WS could be proactive for open rec. HG, but it is holding onto its position relentlessly. WS could change and be a true friend to rec. HG. For starters: WS could announce "closed on Otto Lilienthal's BD in order to allow open rec. HG on such an august rec. HG day. WS benefits from open RecHG. WS, consider expanding the benefit stream and work towards opening Rec.HG 365/yr. Last edited by JoeF on Wed May 23, 2018 9:12 am, edited 1 time in total.